Most disclosure rules globally state that documents should be disclosed in native or near-native in order to retain the utility and functionality of the original document. Providing TIFFs for redacted Excel spreadsheets can often make the resulting file unusable to the other side. RTK.ExcelRedact solves this by providing a native Excel redaction solution that’s fully integrated with Relativity. RTK.ExcelRedact processes an Excel spreadsheet on-the-fly and creates a rendering that preserves the formatting and contents of each worksheet and cell. It then provides “point and click” redaction tools that allow you to redact the rendering. These redactions are then applied to the native Excel spreadsheet. 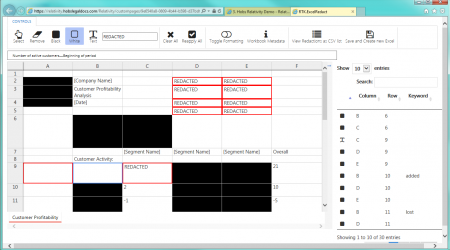 Whilst preparing the file for redaction, RTK.ExcelRedact also discovers tracked changes, comments, embedded objects and images, and exposes headers, footers, hidden workbooks and hidden cells so reviewers can see the entire Excel workbook for redaction. Users can also enter a keyword list and have RTK.ExcelRedact automatically redact all cells containing matching content. All of this takes place using standard Relativity extensibility options so everything can be secured to specific user groups. RTK.ExcelRedact requires no additional dependencies and is deployed using the Application Deployment System.